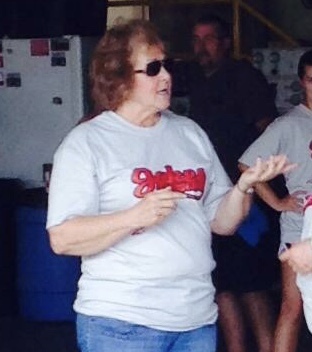 The Millersburg Fire Company is extremely sad to announce that Life Member Linda Lehman has passed away. She was a valued member of the fire company family and one of our staunchest supporters for a long time and we will all remember her with love. We offer our thoughts and prayers to the Lehman Family during this trying time. MILLERSBURG- Linda K. Lehman, age 65, of River St. passed away peacefully in her home on Monday April 9th after a short battle with cancer. Linda was born in Millersburg on April 22, 1952, the daughter of the late Doris Snyder and Robert Henry Neubold. She was the widow of Robert (Jake) Lehman, Jr. Survivors include her son, Troy Lehman and her daughter Christi Moyer (James); grandchildren Austin Lehman, Gage Sutton and Alyssa Moyer. Linda is also survived by her fiance Kenneth Radle, her sister Elizabeth Weaver (Yohann), her step father Wesley Snyder and many nieces, nephews, and great nieces and nephews. Linda was also preceded in death by brothers Steven Neubold and Robert (Bobby) Neubold and David Miller. Linda was a long time employee of Lehman’s Hardware and most recently a part time employee of the TVP Colonnade. She was also a lifetime member of the Millersburg Fire Co. and an EMT with the Millersburg Ambulance Association for many years. She was a member of Reigles Bible Fellowship Anyone who knew Linda, knew that her grandsons were the light of her life. Linda would travel far and wide to watch her grandson Austin play football and baseball or Gage play the drums in the High School band. Austin is now playing for the Penn St. York baseball team and she traveled to Florida to watch their spring training last year. Linda also volunteered with the Millersburg Area Music Assoc. for the last four years. She could be found chaperoning football games, contributing to meals before games and sitting in the stands close to the band. Linda also loved to sit on the front porch of her home and people watch during the summer. She was well known for taking amazing pictures of the sunset over the Susquehanna River and posting them to Facebook for everyone to admire. Many also looked forward to her countdown to Spring every year. Linda was loved by everyone she came into contact with. Her smile always lit up every room she walked into. She would help anyone who needed it and always put her family and others before herself. Her family meant the world to her and she enjoyed spending as much time with them as possible. Linda also enjoyed traveling, especially going on cruises. Most recently, a cruise at the end of 2017 with 23 of her close family and friends. A Celebration of Life service will be held on Sunday April 15th at 3:00 pm at Reigles Bible Fellowship 158 Reigles Church Road in Millersburg. Visitation will be from 1:30 to 3 pm at the church. In lieu of flowers, memorial contributions can be made to Homeland Hospice 2300 Vartan Way #270 Harrisburg, PA 17110 or to Millersburg Fire Co #1 325 Center St. Millersburg, PA 17061. Arrangements by Hoover-Boyer Funeral Home in Millersburg. To sign the guest book go to www.hbfuneralhomes.com.